Picture - A Fairey Hendon flies over. The Fairey Hendon was a British monoplane heavy bomber of the Royal Air Force designed by Fairey Aviation in the late 1920s, which served in small numbers with one Squadron of the RAF between 1936 and 1939. It was the first all-metal low-wing monoplane to enter service in the RAF. The Hendon was built to meet the Air Ministry Specification B.19/27 for a twin-engine night bomber to replace the Vickers Virginia, competing against the Handley Page Heyford and Vickers Type 150. The specification required a range of 920 mi (1,480 km) at a speed of 115 mph (185 km/h), with a bombload of 1,500 lb (680 kg). To meet this requirement, Fairey designed a low-winged cantilever monoplane with a fixed tailwheel undercarriage. The fuselage had a steel tube structure with fabric covering and housed the crew of five, consisting of a pilot, a radio operator/navigator, and three gunners, manning open nose, dorsal and tail positions. Bombs were carried in a bomb-bay in the centre-fuselage. Variants powered by either radial engines or liquid cooled V12 engines were proposed. Picture - The prototype K1695 with two Rolls-Royce Kestrel 600 HP engines. The prototype K1695 (which was known as the Fairey Night Bomber until 1934) first flew on 25 November 1930, and was powered by two 460 hp (340 kW) Bristol Jupiter VIII radial engines. The prototype crashed and was heavily damaged in March 1931, and so was re-built with two Rolls-Royce Kestrel engines replacing the Jupiters. After trials, 14 production examples, now named the Hendon Mk.II were ordered. These were built by Fairey's Stockport factory in late 1936 and early 1937 and flown from Manchester's Barton Aerodrome. 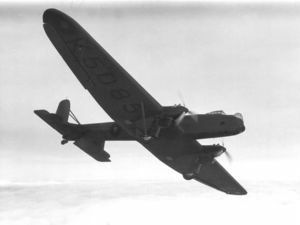 Orders for a further 60 Hendons were canceled in 1936, as the prototype of the first of the next generation of British heavy bombers - the Armstrong Whitworth Whitley - had flown, and it showed much higher performance. The Hendon Mk.II was powered by two Rolls-Royce Kestrel VI engines. It had a fixed undercarriage and a crew of five while the production Hendon Mk.II included an enclosed cockpit for the pilot and navigator. In practice, the type was delayed by the crash and rebuild of the prototype, so the Heyford received the majority of the orders needed to replace the RAF's heavy bombers, the Hendon coming into service three years later. The single Hendon-equipped unit, No. 38 Squadron RAF, began operational service based at RAF Mildenhall in November 1936, replacing Heyfords, later moving to RAF Marham, Norfolk. Later, they went to No. 115 Squadron RAF, which was formed from No. 38 Squadron. The type was soon obsolete and replaced from late 1938 by the Vickers Wellington. By January 1939, the Hendons had all been retired and were then used for ground instruction work, including the radio school at RAF Cranwell. Crosby, Francis. The World Encyclopedia of Fighters and Bombers. London: Lorenz Books, ISBN 0-75481-616-8. Taylor, H.A. Fairey Aircraft since 1915. London, 1974: Putnam, ISBN 0-370-00065-X. Thetford, Owen. Aircraft of the Royal Airforce, 1918-1957. London: Putnam & Company Ltd., 1957.